In 1886 the Calgary District and Agricultural Society held the first Exhibition. There was little more to Calgary than a CPR station, a North West Mounted Police post and about 1000 people. The Exhibition was an opportunity to share knowledge about practicing agriculture in the West, have fun and showcase the best of the West. Though there were a few bumps in the road, the Exhibition became an annual event and attendance continued to grow. 1884 – The Calgary District and Agricultural Society was founded. 1889 – The Agricultural Society purchased 94-acres from the Dominion of Canada and called it Victoria Park. Guy Weadick visited Calgary while with a travelling western showcase in 1908. The city inspired him, and he thought it was on the brink of modernity but still firmly rooted in its "Old West" origins. He believed it would be the perfect place to stage a "Frontier Days and Cowboy Championship Contest." He talked about it with H.C. McMullen, general livestock agent for the CPR, but McMullen felt Calgary was not quite ready. Born and raised in Rochester, New York, Weadick had become captivated by the cowboy lifestyle when he was young. He headed west to learn from real cowboys. After working on various ranches, he signed on to the Miller Brothers' 101 Ranch Wild West Show where he learned "the ropes" of showmanship and became a popular trick roper. Weadick's travels took him to Chicago, where he first met Flores La Due (born Grace Maud Bensell). LaDue was also a trick rider with a different Wild West Show and had left home as a teenager to join the circus. Weadick and La Due married after a five week courtship and began a lifelong partnership. They teamed up on stage for a trick roping show, and performed together on the vaudeville circuit into the 1930s. 1912 - Weadick returned to Calgary with the hopes of holding a "Frontier Days Celebration and Championship"
The Exhibition’s growth attracted national attention. In 1908, the federal government awarded Calgary the Dominion Exhibition, a travelling fair intended to highlight the country’s various regions. International entertainment came for the event, including Miller Brothers 101 Wild West Show, the troupe that Guy Weadick worked with. Guy Weadick returned to Calgary in the Spring of 1912 in search of financing for an event to celebrate the Old West. E.L. Richardson, manager of the Exhibition, introduced Weadick to prominent businessmen and local boosters George Lane, Pat Burns, A.J. McLean and A.E. Cross. The so-called Big Four gave Weadick money and tasked him with putting on the “greatest thing of its kind in the world.” Their enthusiasm reflected Calgarians’ sense of optimism about the region’s future. Taking place in September, the first Stampede had mixed success. It rained for several days and the stands were not covered; due to program management difficulties the daily schedule was unreliable and many events started later than promised. There was no infield and no time limit, so riders often rode out of sight from spectators and sometimes took as much as ten minutes to ride broncs to a standstill. However, the event still had many highlights, the parade in particular was well received. 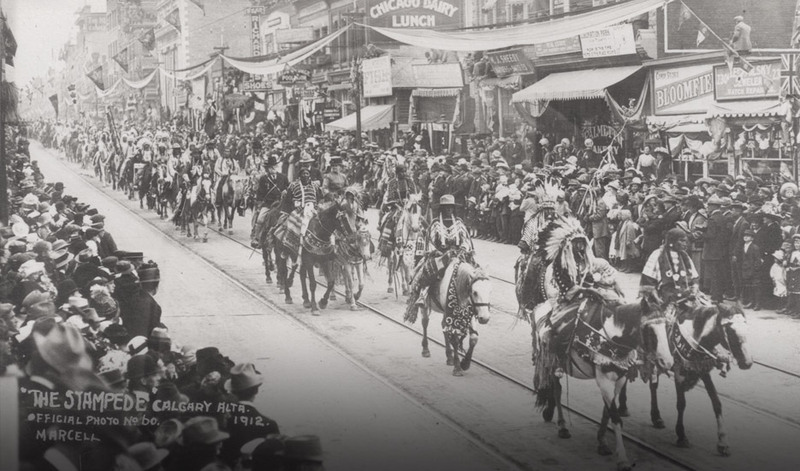 Drawing 80,000 people – double Calgary’s population at the time – the parade brought together Calgarians old and new to collectively celebrate the mythical Old West. The Duke of Connaught (who was the Governor General of Canada at the time), his wife the Duchess of Connaught (Princess Louise Margaret), as well as their daughter Princess Patricia attended the parade and rodeo events and were a huge draw. The rodeo also brought exciting action. Families from Treaty 7 Nations camped on Victoria Park, forming the original “Indian Village,” which remains a Stampede staple to this day. 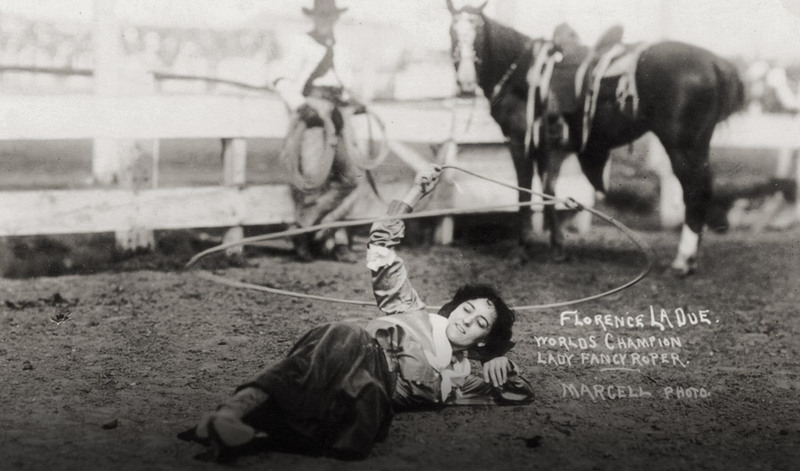 Flores LaDue shows off her fancy roping skills. First Nations man in Indian Village, ca. 1920s. 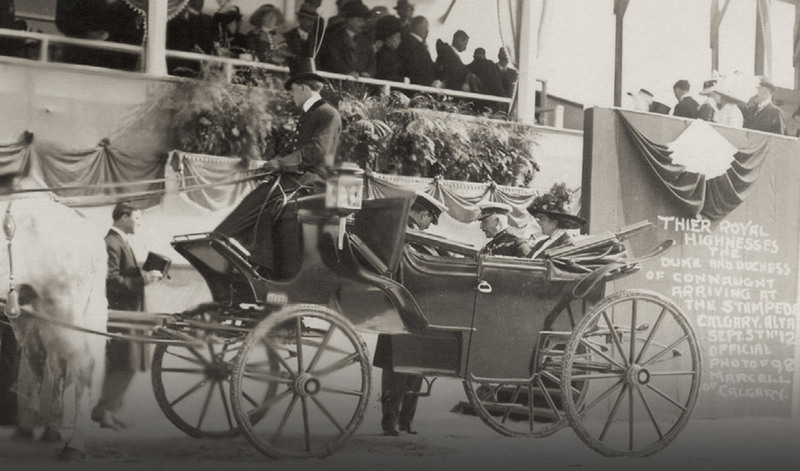 The Duke and Duchess of Connaught attended the first Stampede; here they are arriving at the Grandstand. 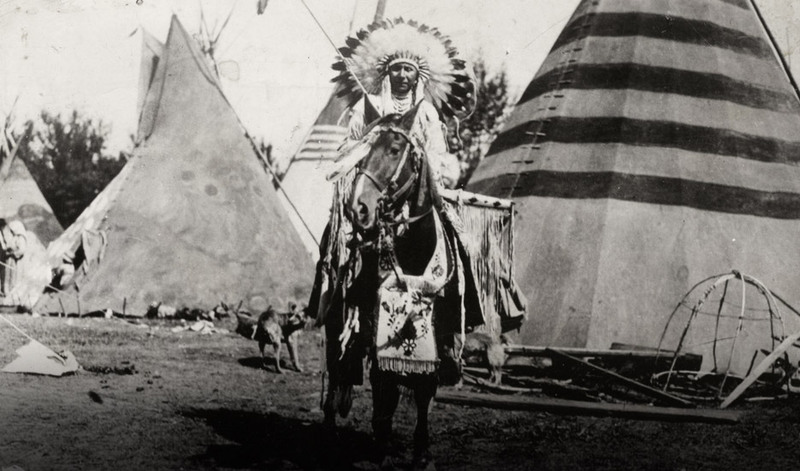 Some 1,800 First Nation individuals led the first Stampede Parade in 1912. 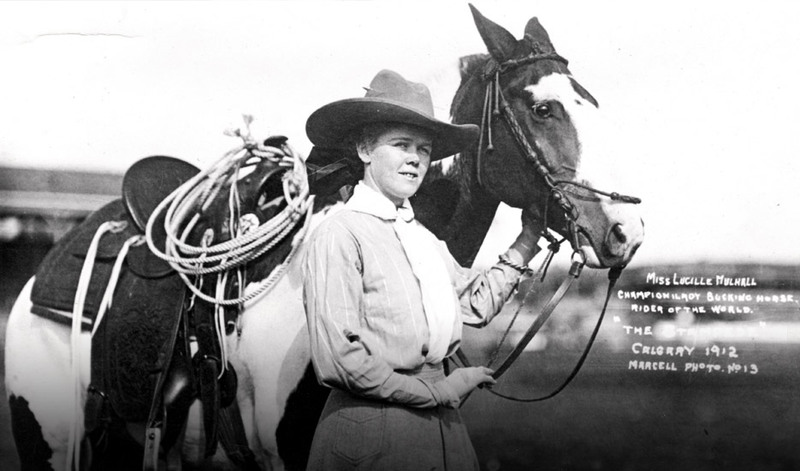 Women competed in many rodeo events at the first Stampede; Lucille Mulhall, pictured here, won the title of Champion Lady Bucking Horse Rider of the World. 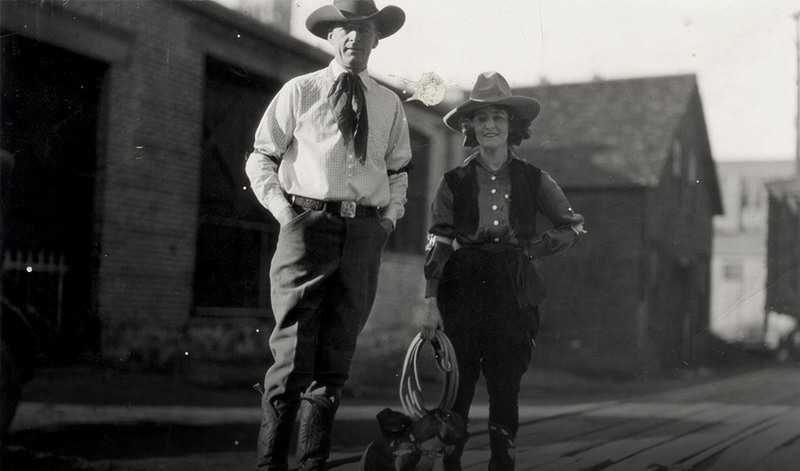 Stampede founder Guy Weadick and champion trick rider Flores LaDue pictured with their dog at the first Stampede. The husband and wife pair met while touring as performers for the Miller Brothers 101 Wild West Show. A second Stampede was not held in 1913 in Calgary. Weadick took his show on the road to Winnipeg. But economic downturn hit Western Canada and dimmed the prospects for holding another one in 1914. Then, in August 1914, the First World War broke out.